Hank Gowdy holds the distinction of being the only active major leaguer (a player during WWI and a coach during WWII) to serve with the armed forces in both World Wars. Henry M “Hank” Gowdy was born on August 24, 1889 in Columbus, Ohio, and played football, basketball and baseball at Hubbard Elementary and North High School in Columbus. Gowdy’s major league career began in 1910, when he played seven games for New York Giants. He batted .214 that season and after a few games during the 1911 season, he was traded to the Boston Braves. In the 1914 World Series, Gowdy, despite batting just .243 during the regular season, batted .545, with three doubles a home run and a triple to lead the Braves to a four game sweep of the Philadelphia Athletics. On June 1, 1917, Gowdy became the first major league player to enlist in WWI when he signed up to serve in the Ohio National Guard. He reported for duty on July 15, 1917, and was soon heading for the front lines in Europe. Gowdy served with the 166th Infantry Regiment of the 42nd Infantry Division. He carried the colors during the war for his fighting unit. By March 1918, the 42nd Division were in the Lorraine region of France, where they faced fierce attacks by German forces. Despite repeated artillery bombing and bloody hand-to-hand combat they held their ground but suffered thousands of casualties. 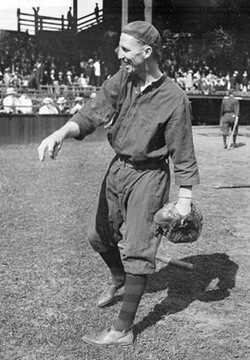 Gowdy returned to a hero’s welcome and continued to play for the Braves from 1919 through 1923. He was then traded to the New York Giants. Gowdy ended his playing days back with the Braves in 1930. He then began a career in coaching, remaining with the Braves until 1937. He joined the Reds’ coaching staff in 1938. During the 1942 season, Gowdy applied for military service but was rejected. But in January 1943, the Army changed its mind and, at age 53, Gowdy received a commission as a captain. During the early days of WWII, Gowdy spoke up for athletes labeled physical rejects. "A man should be physically perfect for military service," he explained, "because it calls for sustained action over a long period over exceedingly trying conditions. In baseball a man with a handicap often can meet the game's demands. Of course, he is not continually in action as frequently is the case in the Army." Captain Gowdy held the post of special service officer at Fort Benning's infantry officers' training command, where on March 31, 1925, the baseball field had been renamed “Hank Gowdy Field” in his honor. In 1943, he directed the Infantry School league at Fort Benning. Included in the league line-up of players were Lieutenant Jim Prendergast, who was pitching for the first student training regiment Wolves, Staff Sergeant Benny Zientara, who played second for the Academic Regiment Profs, and Corporal Ewell Blackwell, who pitched for the third student training regiment Rifles. On August 27, 1943, Major Gowdy coached a team of servicemen players from Camp Cumberland, Pennsylvania, against the New York All-Stars – a team made up of players from the Giants, Yankees and Dodgers. Nearly 40,000 fans watched the All-Stars at the Polo Grounds defeat the servicemen 5-2. Gowdy had risen to the rank of major before leaving the Army in November 1944 and returning to the major leagues in 1945 to resume his role a coach with Cincinnati. In 1947 he joined the Giants’ coaching staff and remained there until 1948, when he retired from baseball. Hank Gowdy passed away on August 1, 1966, in his hometown of Columbus, Ohio. He was 76 years old. Copyright © 2015 Gary Bedingfield (Baseball in Wartime). All Rights Reserved. Copyright © 2000-2015 Gary Bedingfield (Baseball in Wartime). All Rights Reserved.